This time of year always gets so busy. From now until after Christmas our time and attention become more and more divided. We lose the ability to enjoy the here and now. Before we know it we have become numb to the core. 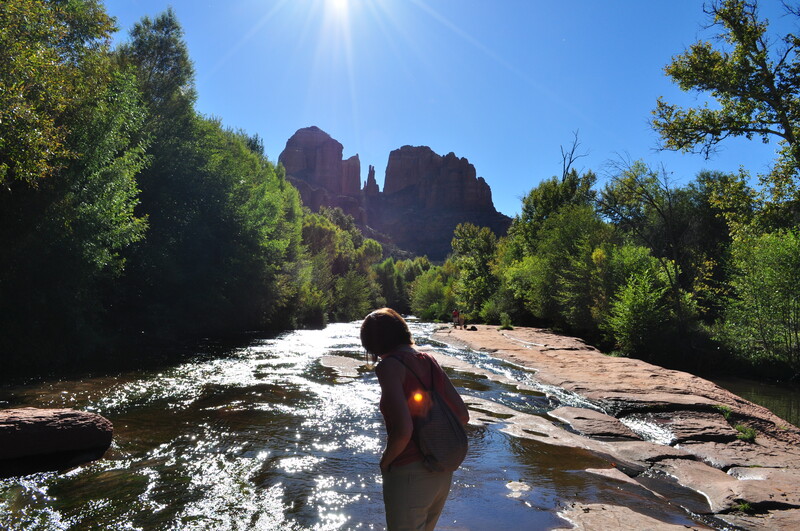 So I was drawn to this photo of my sister Lana on a recent trip to Sedona. Her husband Rob caught the awe and wonder of the place. That’s Cathedral Rock in the background, but perhaps the true sacred space is where they are standing. Such beauty stops us cold and demands our attention. Our hearts burst open with joy, warmed and nourished by the wonder of creation. God could have made a world out of black and white squares, yet instead, choose to create beauty, stunning, awe inspiring beauty. When our daughter Tori was a toddler, she started the Lord’s Prayer like this, “Our Father, who does art in heaven, Howard is thy name”. We started to correct her, only to realize her mistake reflected a greater truth. Perhaps this wild, wonderful beauty is a reflection of the divine nature of God and the eternal light of our souls. Grace abounds when we hold open a space, make room for mystery, cling fast to hope. That grace is often unpredictable, arresting, surprising, and yes, transforming. We need time apart in wild places to be reminded of who we really are, children of the Most High. John Muir says it best.